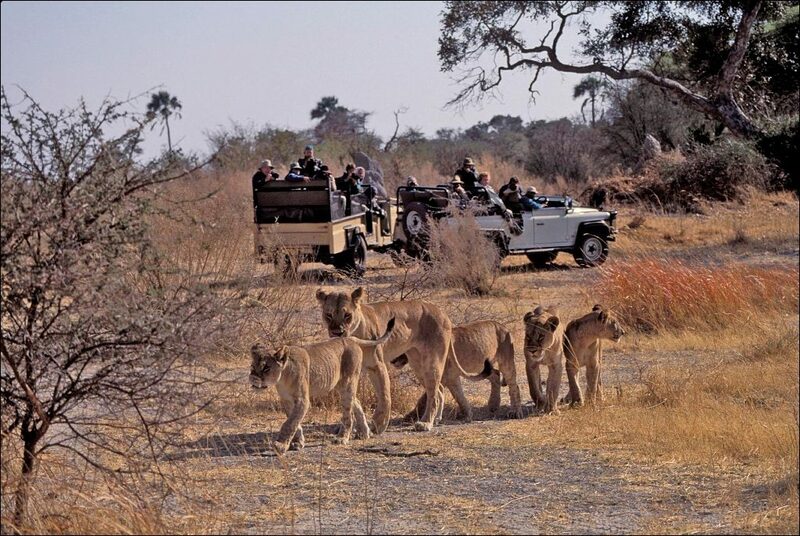 A lioness with three cubs walking through the grass in the Okavango Delta in Botswana with safari vehicles in the background. I am excitedly anticipating joining Wolfgang for the first time on a trip to Botswana! Our daughter went with him when she was in high school and fell deeply in love with Africa and the wildlife. 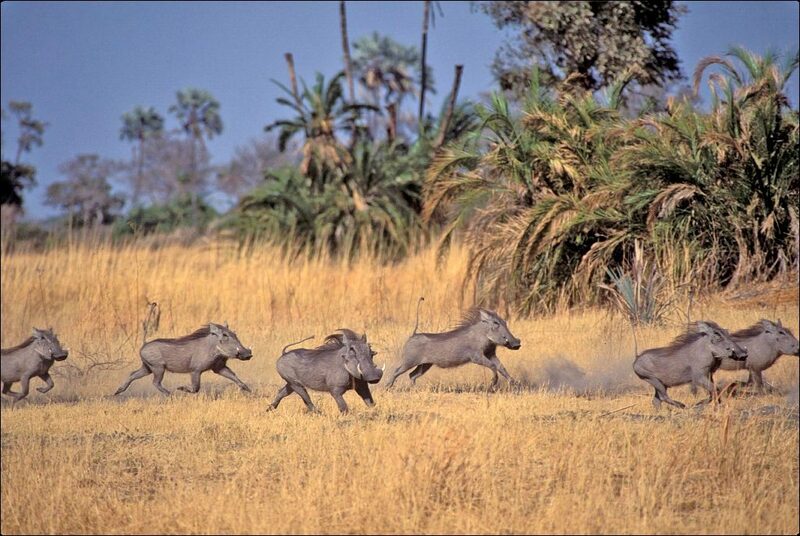 A group of common warthogs (Phacochoerus africanus) running away from lions in the Mombo area of the Okavango Delta in Botswana. My favorite story that Wolf likes to tell is of the day they spotted a lioness with 3 cubs. The mother was carefully teaching her youngsters how to hunt. She surreptitiously crept behind the Land rover as Wolf and his clients watched her. Then she called out to her cubs which came bounding out of the brush to charge a group of warthogs. Their effort was commendable but was chalked up to a learning the warthogs got away. 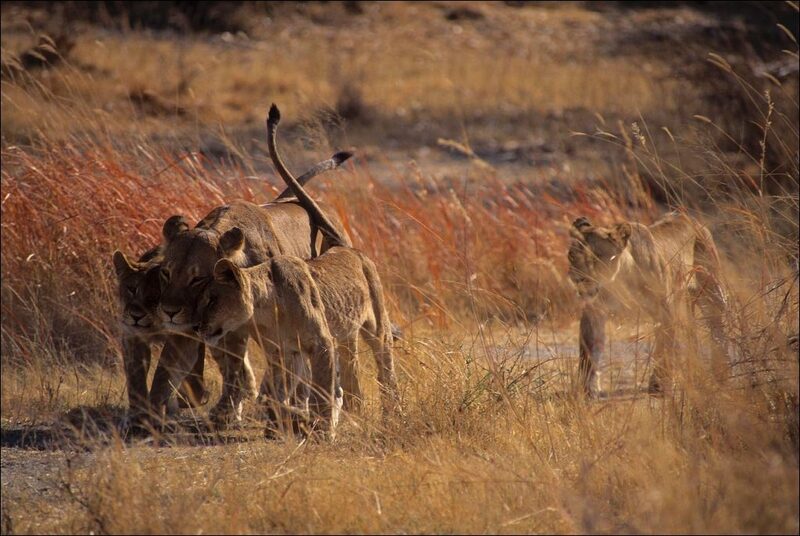 A lioness with three cubs showing affection while walking through the grass in the Okavango Delta in Botswana. The next day, Wolf and his group spotted two leopard brothers feeding on an impala kill up in a tree. They watched the pair feeding until, to their surprise, the lioness from the day before appeared. 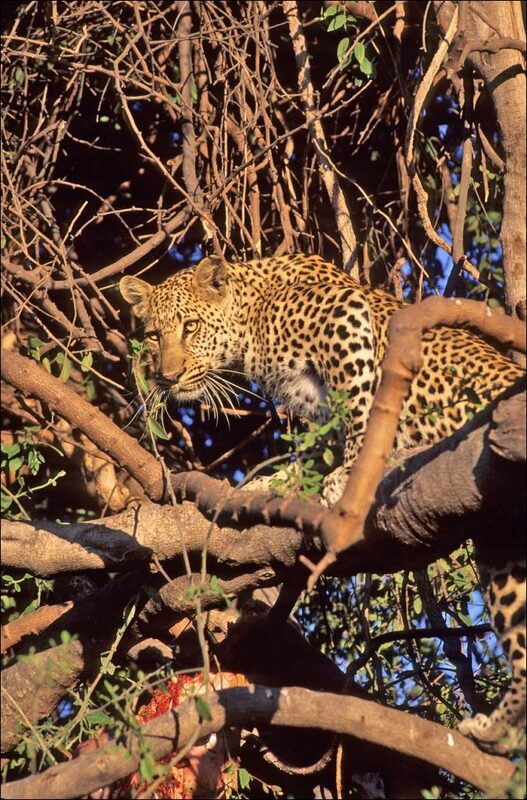 Fearful of the giant feline, the leopard’s raced down the tree and disappeared in the savannah. Out of the tall grasses came the three little cubs. Eyeing the impala kill, the mother realized she couldn’t climb up such a spindly tree. But she had a plan. She sent her three determined cubs up the tree. Yanking and tugging, the cubs finally loosened the impala from the branches’ grasp and the impala fell to the ground. Lesson two was a success--down came the cubs and the whole family enjoyed a moveable feast. 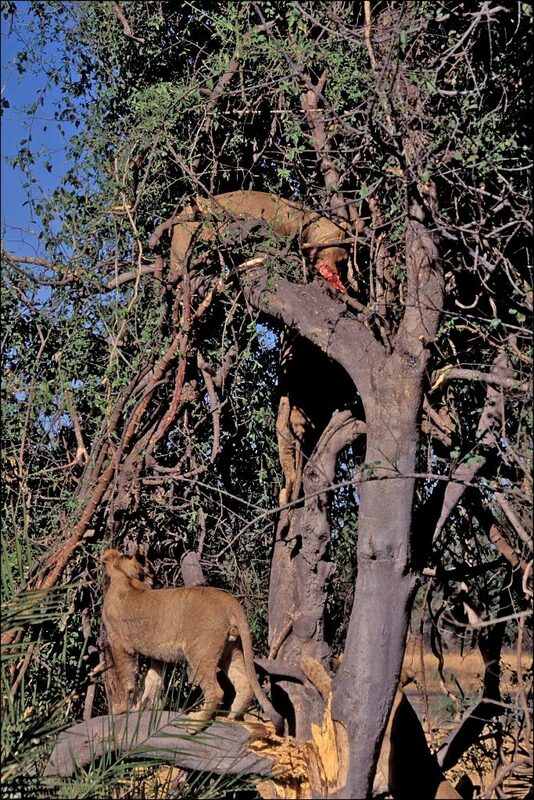 A leopard (Panthera pardus) with an impala kill in a tree in the Okavango Delta in Botswana. 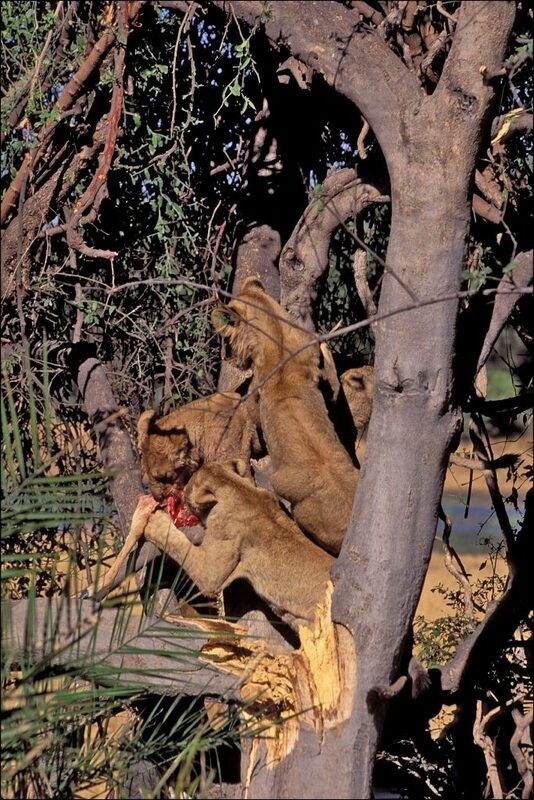 Lion cubs (Panthera leo) climbing up a tree to get a leopard kill (impala) out of the tree in the Okavango Delta in Botswana.